This week I had my last JP drain out and a checkup where the surgeon said the scarring is looking good and there is good early signs of nice body contouring. He wants me to start walking more and getting active in moving around, it pains a bit after a while of being on my feet but I understand it's good for recovery. I do still find myself really quite bloated in the thighs and legs, though it's gotten a bit better (math says I'm around 20lbs still heavier than I "should" be). 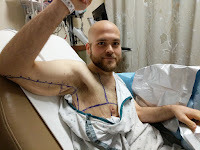 Much of my steri-strip tape that was placed on during surgery is now working free, and I've been given the all clear to work the rest off after one more week of keeping it on. It's there to provide just the extra support in forming the new seems and minimizing the stress on the wounds as it tries to heal. As for pain, yes, I still find myself in some but it's incredibly manageable. For the most part save for a few times here and there I've taken myself off prescription pain meds and now take ibphrophin through the day. Ironically, I'd say my compression clothing (especially the vest) is causing me more pain than the wounds themselves. Just the nature of squeezing your body puts stress on muscles not used to it, pressure on seemlines of the clothes and many of my wounds are sore from the constant compression on top of them. 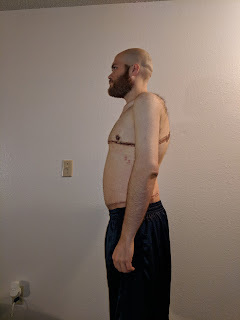 After waking up in intense pain from my back wounds, I did sleep for the first time on a nearly vertical side position! 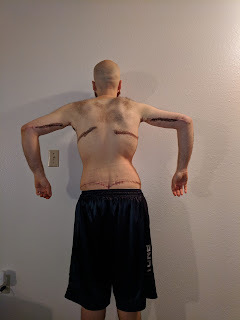 It was incredible to move the pressure off that wound and just to sleep in a position other than flat back. Andrew I so enjoy reading about your journey. And you look fantastic! I hope the rest of the healing process will go quickly! Definitely will do! The eight weeks mark is a few days away and I plan on doing just that! Thanks for the kind words. Well, it's been a while since I've updated on my progress but I wanted to give my body some time to heal and show some nice progress. 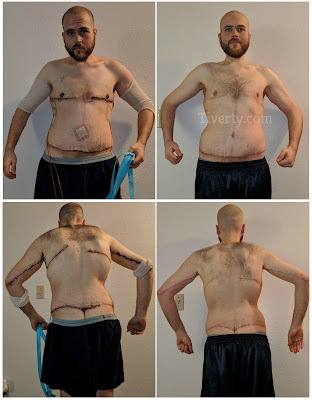 So far it's been eight weeks as of today since I went under the knife and got my extra skin removed after losing 250lbs of my body weight. 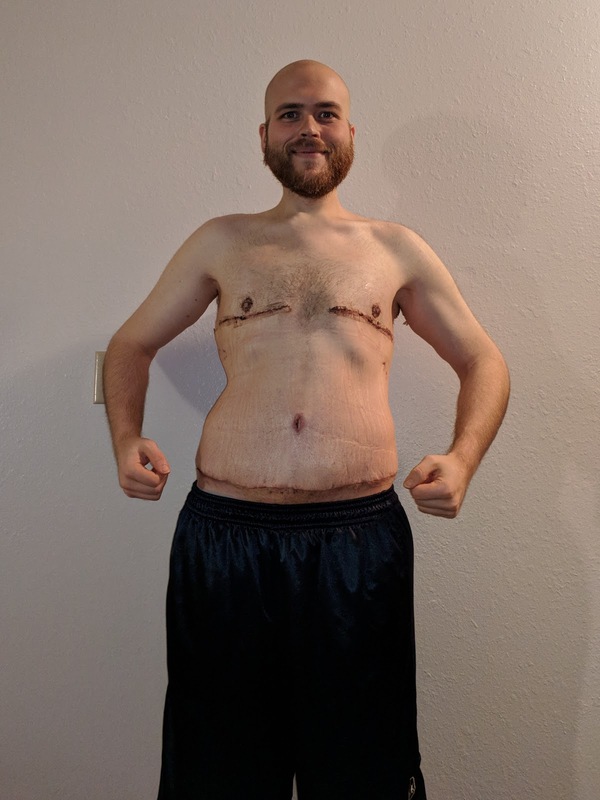 The weight loss alone has been an insane boost to my confidence, state of mind, and health. The skin removal has just been the best buttercream frosting on that cake.